Award-winning animal rights activist and journalist, Magda Hejda, has attacked plans to relocate Krakow’s beloved statue of Dżok the dog. 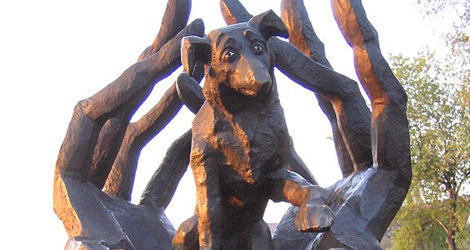 The Dżok monument, remembering the loyalty of a Cracovian canine to his absent master and dedicated to homeless animals, has stood by the river on Bulwar Czerwieński since 2001. Now, the effigy is due to be relocated to make way for a monument to the soldiers of the Armii Krajowej (Home Army) – the largest Polish resistance force during World War II. Writing in Gazeta Krakowska, Hejda points out that the location of the Armii Krajowej monument was supposed to be decided by public consultation – a process that ended in 2011, with a different site closer to Wawel Castle gathering the most votes. In September this year, the cornerstone of the new monument was placed near the Dżok statue. Hejda wrote at the time that city authorities had not informed the creator of the Dżok statue, Prof. Bronisław Chromy, that his work was to be relocated. Prof. Chromy is a highly respected sculptor and teaches at the Jan Matejko Academy of Fine Arts. He is also responsible for the Wawel Dragon statue and dozens of other public artworks in Krakow and throughout Poland, including memorials to World War II resistance fighters. The real Dżok became a local legend in the early 1990s. When his owner had a heart attack on the street and was taken away by ambulance, the faithful hound remained on the spot for a full year awaiting his master’s return. Dżok finally went to live with a local woman who had been feeding him, but was sent to an animal shelter after she died in 1998. Within hours, Dżok escaped the pound, and was killed by a train.